Religious art and custom murals. 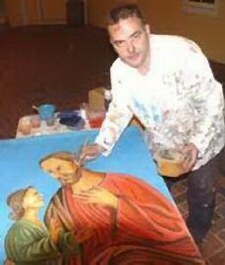 Commission an inspirational fresco, mural or oil painting of Jesus or of your protective Saint. 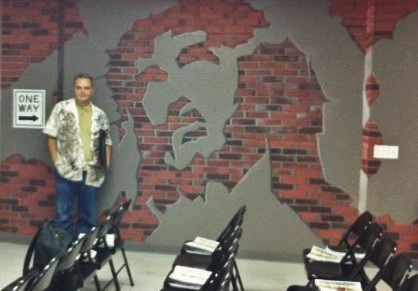 Jesse Demolli can create elaborate murals, a portrait of your favorit Saint, canvas banners and icons. Religious art can be highly decorative in your home or businees, like classic icons or, you may want a Bible story painted in your fellowship hall. Jesus Resurrection - Window art, Hudson Florida.. 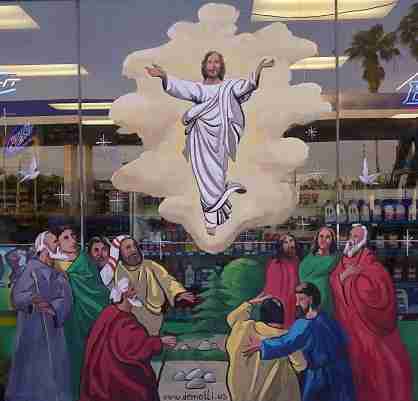 This painted window of the Resurrection of Jesus was painted at a local business on Hudson Avenue in Hudson, Florida for Easter in 2013. These life sized figures were awe inspiring and drew much attention as they were painted. Artist Jesse Demolli specializes in glass painting and window art. 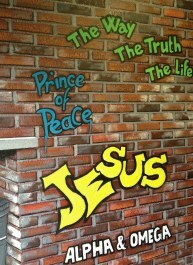 Murals and Scripture writings on the walls of First Assembly of God in Mulberry, FL. 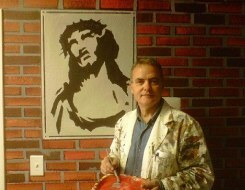 Artist Jesse Demolli, was hired to paint religiouse murals and Scriptur writings on the walls of the youth building at First Assembly of God in Mulberry, FL. 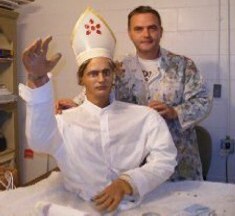 The Saint's likeness will be a part of the traditional procession at the San Gennaro Festa in Safety Harbor, FL. Artist Jesse Demolli has been commissioned by the Italian-American Women of Today (LIADO) to recreate Saint Gennaro as part of the preparations for the 6th Annual San Gennaro Festa to be held February 14th and 15th in Safety Harbor, FL. Saint Gennaro is the patron Saint of Naples, Italy and his likeness will be carried during the traditional procession at the festa. 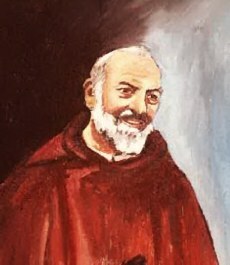 Portrait Painting of Padre Pio.